One of our era’s most popular artists and a leading art critic take us on a tour from cave paintings to computer drawings. The tour is meant for children but will surely engage anyone, including professional artists, interested in aesthetics and communication. The book’s most original contribution is its comparisons of much earlier paintings with recent works (all reproduced in exquisite colors); for example: Jan Van Eyck’s Arnolfini Portrait (1434) of a Bruges merchant, his wife, and their pet side by side with Hockney’s portrait of Mr. and Mrs. Clark and their cat Percy, 1970–71. Not only did Van Eyck pioneer the use of layered oil paint but he included objects rarely painted before him—a shiny clock on the wall, oranges on a window sill, slightly dirty wooden clogs, and the couple’s tiny dog. Another example: Hiroshige’s view of a Japanese harbor, circa 1850, next to Van Gogh’s portrait of Pere Tanguy (1887) with the bright colors and absence of shadows characteristic of Japanese models. What makes an interesting mark? 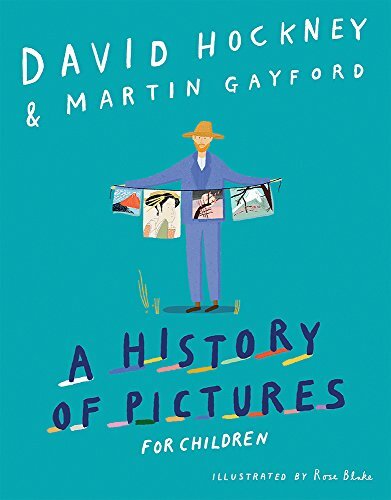 The authors juxtapose a 13th century Chinese ink drawing of six persimmons and a 17th century Rembrandt ink wash sketch of a child being taught to walk. Rembrandt does not use many lines, but we can tell that the mother’s skirt is ragged and that the watching milkmaid carries a heavy bucket. Perspective? To make their point, the authors compare a Florentine painting of a hunt, the dogs and horses shrinking in the distance, with a Hockney collage of 850 photos of a highway in California vanishing toward the horizon. Reflections? The authors compare a Monet painting of his Giverny lily ponds with a Hockney study of water in a Phoenix swimming pool. Stories? Leonardo’s Last Supper illustrates the moment when Christ tells his disciples that one of them will betray him. Next to the late 15th century masterpiece is Edward Hopper’s Nighthawks (1942) inviting us to imagine what happened to the three lonely patrons of a late-night coffee shop and what might happen next. Over the centuries people invented ways of tricking the human eye into thinking images were moving. If the eye sees more than 16 images per second, it will see them as one “moving picture.” The authors review Muybridge’s photos of horses in motion (1878), the first public film show presented by the Lumière brothers in Paris in 1895, a Trip to the Moon by Méliès in 1902, and the moving elephants in Walt Disney’s Jungle Book in 1967. Hockney writes that the artists who drew that sequence had looked closely at the way the animals’ muscles and bones moved and made it very clear. This book will delight, educate, and stimulate persons of all ages. The section on motion pictures helps one appreciate what goes into a DreamWorks animation. Walter Clemens studied painting at the Academy of Fine Arts in Vienna, UCLA, the Smithsonian Institution, and Boston University. His work has been shown at the Danforth Museum. He is completing a book illustrating Mozart’s Magic Flute.